on Tuesday December 20, 2016, 5.15 pm, EPFL room MXF-1. Abstract — Quantum chemistry is a fundamental tool for the understanding and prediction of catalytic processes. I will discuss our computational studies on homo- and heterobimetallic compounds featuring metal-metal multiple bonds and their reactivity. Various quantum chemical methods are employed to study these systems, ranging from Kohn-Sham density functional theory to our newly developed multireference version of density functional theory. I will then discuss our recent investigations of supported Ni and Co catalysts at the Zr6 node of the metal-organic framework NU-1000. These systems exhibit interesting properties in catalyzing ethylene dimerization and hydrogenation. Computational studies reveal important insights regarding the possible mechanisms of the catalysis. A library of transition metals is now under investigation, in order to screen for the best catalyst, and structure-function relationships are beginning to emerge from computational screening. About the speaker — Laura Gagliardi was born and raised in Bologna, Italy. She completed her undergraduate and graduate studies at the University of Bologna. She defended her PhD thesis (in theoretical chemistry) in 1997, focusing on the development of configuration interaction methods. She then spent two years as a postdoctoral research associate in Cambridge, UK, where she worked on density functional theory and actinide chemistry. She started her independent career as an assistant professor at the University of Palermo, Italy, in 2002, and two years later received the annual award of the International Academy of Quantum Molecular Science to scientists under 40. 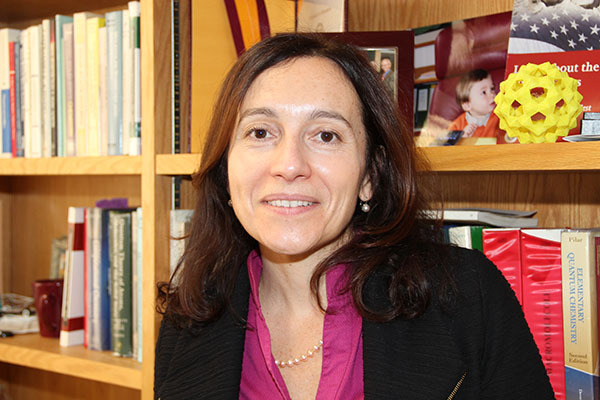 In 2005, she moved to the University of Geneva, Switzerland as an associate professor, and in 2009 she moved to the University of Minnesota as a full professor—the latter institution recognized her as a Distinguished McKnight University Professor in 2014, and she currently directs Minnesota’s Chemical Theory Center. Since 2014, she has also been director of the Inorganometallic Catalyst Design Center, an Energy Frontier Research Center funded by the US Department of Energy. In 2016 she won the Bourke Award of the Royal Society of Chemistry, UK and she became a fellow of the Royal Society of Chemistry, UK. Since 2016 she has become associate editor for Journal of Chemical Theory and Computation, an American Chemical Society publication. Gagliardi develops novel quantum chemical methods and applies them to problems related to sustainability. Specifically, she explores molecular systems and materials used in catalysis, separations (including carbon dioxide sequestration), and in photovoltaic applications. She is also interested in photochemical processes and heavy-element chemistry. Her research is aimed at explaining existing phenomena and predicting structure-function relationships for new molecular and material design. She has co-authored more than 240 peer-reviewed papers.